The U.S. Department of Transportation has announced the recipients of nearly $600 million in funding for major infrastructure projects. The grants provided by second round of the Transportation Investment Generating Economic Recovery (TIGER) program will help pay for new transit systems, rail improvements, and bridge and road repairs with the goal of supporting environmental sustainability and long-term economic development at local and regional levels. In contrast to the Highway Trust Fund, which distributes 80 percent of federal funds for highways and only 20 percent for transit, TIGER II distributed grants more equitably: 29 percent for road projects, 26 percent for transit, 20 percent for rail projects, 16 percent for ports, 5 percent for planning projects and 4 percent for bicycle and pedestrian projects. Notably, the largest grant, $47.6 million, was awarded to Atlanta for a streetcar line between downtown’s Centennial Olympic Park and the Martin Luther King Jr. historic district. In keeping with TIGER’s objective, the Georgia Transit Connector offers a more energy efficient means of getting around, as well expectations for 40 long-term jobs in operations and tens of thousands more resulting from transit-oriented development. Additionally, $26 million was granted for Salt Lake City’s Sugar House Streetcar, which expects to remove some 800 cars from congested local streets. $10 million will help Orlando connect its LYMMO bus rapid transit to one of the city’s oldest transit-poor neighborhoods. Even more interesting than construction of better transportation infrastructure is destruction of the worst. Grants were specifically awarded to undo the damage done by urban highways: unwalkable streets, isolated neighborhoods, destroyed home and businesses. 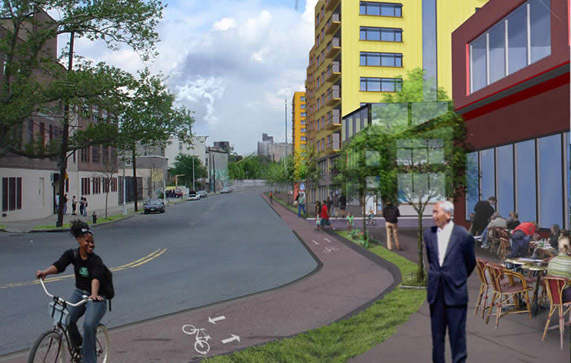 New Haven, Connecticut received $16 million to begin replacing nearly a mile of downtown highway with boulevards and a reconnected street grid. Similarly, planning grants were awarded to study removal of the Sheridan Expressway in the Bronx and the Claiborne Highway in New Orleans as options to reunite divided neighborhoods. Along with the complete list of grant recipients, these projects reflect a more holistic approach to funding that not only prioritizes sustainable transportation systems, but communities as well.